Module that constitutes the set of capabilities of osMarkets to connect to brokers and data providers to obtain market data. It is an architecture of data ingestion specialized in financial markets, configurable and extensible. The Data Ingest module is also prepared to read from valuable sources for making decisions in the financial field, such as historical data sources, news, social networks, etc. Allows you to send purchase or sale orders to different brokers. The module is designed with the security of capital as the central point. It includes global risk management, a robust and fault-tolerant communications system, optimization systems for operations aimed at reducing broker commissions, a global positioning system including all markets and strategies, etc. It also has an additional external monitoring component capable of making decisions by itself to recover the system automatically against failures or launch notifications in case the global system could not recover automatically. Working with market information is not trivial and involves processing time series where resampling concepts are used, reading historical data or market views with greater or lesser detail. The data preparation module allows us to adapt the information to the way we will work with it in these Trading environments. This module provides different tools of technical analysis, algorithms and processes of Machine Learning and Data Mining as well as other indicators of higher level oriented to the interpretation and decision making about the financial markets. They have low-level interfaces to communicate with each other as well as high-level interfaces for graphic representation through the IDE / Data Visualization module. Module designed to guarantee, as far as possible, that the results obtained in the analysis phase will continue to be reproducible during the execution of the strategy in real time. For this purpose, it uses various techniques to analyze the changes in the different financial markets and applies modifications in the strategies to maintain a constant adaptation to the changes. To implement all these capabilities, it uses machine learning elements such as genetic algorithms, neural networks, transfer learning models, correlations and other statistical tools. 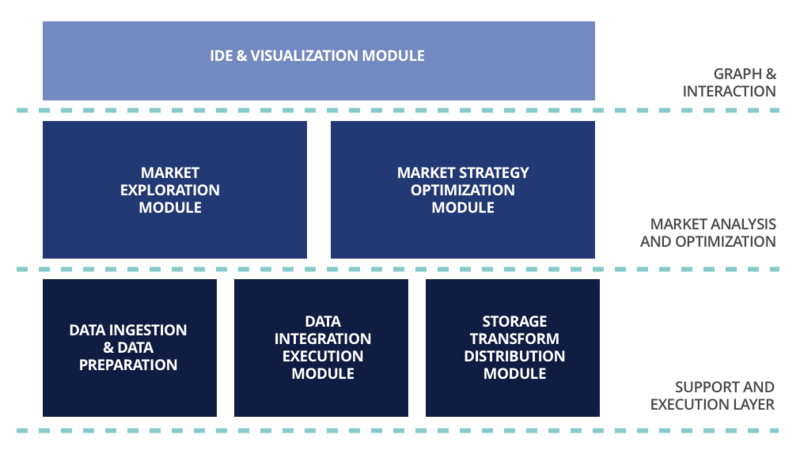 The IDE / Data Visualization module is a high-level graphic tool aimed at facilitating the interpretation of financial markets. The objective is to help in the identification of sustainable inefficiencies in the market that can be exploited automatically using algorithms. It provides different views of the financial markets, incorporating both classical tools of technical analysis and more advanced tools such as Machine Learning techniques, Data Mining or correlation analysis. Models of deep learning and transfer learning, through the use of neural networks based fundamentally on Tensor Flow, focused on obtaining risk modifying factors in the Walk Forward processes. Correlation analysis, correlation tools between sets of configurations of the same strategy or between different strategies is widely used as a tool in osMarkets. MonteCarlo simulations for the exploration of parameters of the strategies in the walk-forward process. Statistical models and portfolio optimization through correlation analysis and performance filters.